Socialism is dead in Myanmar. Whoever wants to meet socialists in the country today, has to pay a visit to the headquarters of the National Unity Party in Yangon’s Bahan Township. There, around a dusty yard with a flagpole, are some wooden barracks in which the party leadership defends what is left of socialism. Party members include older men such as U Khin Maung Gyi, former Minister of Commerce under Ne Win and a leading member of the Burma Socialist Program Party (BSPP). When the Burmese’s journey toward socialism ended in 1988, the BSPP was also dissolved. The term „socialism“ vanished more and more from the political landscape. U Khin Maung Gyi lost his post, his party and for the moment his political home. But in the 1990 elections, the socialists had regrouped in the NUP. The NUP was founded on October 12, 1988. Chit Hlaing, the theorist of Burmese socialism, became part of the Central Executive Committee. Therefore, the NUP can be seen as the direct successor party of the BSPP. The NUP regards itself, as the former Minister of Trade explained during our meeting in 2013, as a party that is left of the center. Despite abandoning the planned economy model, the party in principle adheres to the socialist tradition of the BSPP. In 2013, U Khin Maung Gyi was still optimistic about the future. He hoped to score victory in the 2015 general elections and enter all the parliaments. But things didn’t turn out that way. In 2015, the NUP won only one seat in the House of Nationalities. Socialism in Myanmar and its last adherents will most likely disappear in the coming years. For most people, particularly the younger generations, socialism today is synonymous with an obsolete failed ideology. Socialist and communist ideas have played a major role since Myanmar’s independence movement of the 1930s and 40s. The independence hero Aung San himself was a founding member of the nation’s first communist cell. His speeches and writings are full of socialist ideas and Marxist terminology. One of the most important thought leaders of the second generation of Burmese socialists was U Chit Hlaing. He was born on March 15, 1926, in the district of Katha. Katha is located on the upper reaches of the Irrawaddy in the Sagaing region. The just 16-year-old high school student joined the Burma Independence Army (BIA) in 1942 to fight against British colonial rule. After the expulsion of the British by the Japanese and reorganization of the BIA into the Burma Defense Army (BDA), he received a six-month officer training. During the occupation of Burma by the Japanese, he held the rank of sergeant. In addition to his military education, Chit Hlaing, as a teenager, encountered communism and Marxism-Leninism. As a member of the Nagani Book Club, he also studied writings on left leaning nationalism. Chit Hlaing himself admitted that he was hugely influenced by Thakin Soe, who published the book Socialism in 1939, in which he first published texts by Marx, Engels, Lenin and others in Burmese language. Another influential figure was the socialist Thakin Tin Mya. Through his teachers, Chit Hlaing became a supporter of communism, joined the Burma Communist Party (BCP) and promoted communist cell members within the army. At the start of his career, Chit Hlaing was in three camps, which would later go on to become bitter enemies. First, he was in the military, which cooperated with the Japanese under the leadership of Aung San. Second, he was among the communists, whose more radical representatives rejected cooperation with the Japanese military government. Third, he maintained good relations to Thakin Tin Mya’s socialists. When Aung San broke with the communists in 1946, Chit Hlaing renounced – at least verbally – the communists who had committed themselves to a global revolution under the leadership of the Soviet Union. Within the AFPFL, he became a member of the Socialist Party (SP). He bet on socialist evolution instead of communist revolution. In his own words, he exchanged the red for a pink ideology. Together with like-minded people, he founded the People’s Literature Company, in which he translated numerous texts of figures like Marx and Mao, which he also commented on under the pseudonym Maung Chit Gyi (later he used the pen name Ko Ko Maung Gyi). In August 1951, Chit Hlaing traveled to East Berlin as an AFPFL representative for an international youth congress. The congress’ sponsor was the Soviet Union. He then hoped to continue his studies in the Soviet Union, but Htun Shein, a member of the Burmese Communist Party (BCP), opposed Chit Hlaing’s attempt. One reason might have been that Chit Hlaing lacked genuine communist conviction. Finally, Chit Hlaing didn’t get the permission by the Communist Party of the Soviet Union (CPSU). Instead of Moscow, he landed in Paris, where he lived until 1955 and studied philosophy. According to his own account, Chit Hlaing largely renounced political activity during his time in Paris, fearing that he would attract the attention of the secret police and possibly lose access to French universities. At the same time, he came into contact with new socialist ideas. Through a friend he became aware of the special path taken by Yugoslavia under Marshal Tito. The communist Tito had defied Stalin in 1948, without joining the Western camp during the Cold War. Instead, he was a leading representative of the Non-Aligned Movement, founded in 1961 in Belgrade. The Non-Aligned Movement and its predecessor the Bandung-States of 1955 have been well received in Burma. The example of Tito showed that there was not just orthodox communism, and that the Marxist-Leninism of the Soviet Union could be criticized. With this new perspective, Chit Hlaing returned to Burma in 1955 against his will and at the request of Colonel Aung Gyi. Colonel Aung Gyi was one of the most important figures in post-colonial Burma. Together with Maung Maung he held the reins of leadership within the Tatmadaw in the 1950s. On the request of Colonel Aung Gyi, Chit Hlaing became a member of the Directorate of Psychological Warfare (DPW), whose central tasks included the drafting of a military doctrine and anti-communist propaganda. The objectives should be achieved by training the officer corps, producing propaganda material such as pamphlets, radio broadcasts, etc. One of the first key documents Chit Hlaing wrote in his new role for the Tatmadaw under the guidance of Maung Maung was titled The National Ideology and the Role of the Defense Services. The document defined the relationship between Tatmadaw and politics. Task of the Tatmadaw is the defense of the state ideology. The state ideology, in turn, formulated the goals of peace, the rule of law, democracy and a socialist economic system. In addition to working for The National Ideology, Chit Hlaing was a diligent writer in the military-published magazine Myawaddy , which appeared since 1952 and had a circulation of 18,000 copies in 1956. In his articles, Chit Hlaing criticized Stalinism, the Communist Party of Burma (BCP) and developed the outlines of his own political philosophy namarupa wada. To do so, Chit Hlaing used traditional Buddhist terms and tried to give them a different or new meaning. Given the lack of not yet existing terms for core concepts of Marxism and Socialism a natural approach (Thakin Soe’s approach was quite similar). Wada, on the other hand, indicates that the phrase is an -ism (as in communism, capitalism). Namarupa is therefore an abstraction. In Chit Hlaying’s conception, Namarupa Wada was to lay a philosophical foundation for a future socialist state. His hope was to promote the unity of the country by mixing Marx’s materialism with Buddhist elements so that the new ideology would be acceptable to Buddhists as well. Namarupa Wada was decidedly anti-communist and nationalist. From the perspective of Western philosophy, Chit Hlaing’s philosophical concept was abstract and overly complex; a paper overloaded with jargon and ambiguous Pali terms, as Nakanishi criticizes. At the end of 1957, Chit Hlaing took on a position as a lecturer in political thought at the Directorate of Psychological Warfare. He summarized his articles and his ideology in the handbook Ideology Critical for the Development of Human Nature and Democracy. These theoretical writings were, however, only ever known to a handful of officers or intellectuals. In the power struggles of the subsequent years, which fell in the same time period as the splitting of the AFPFL in 1957, within the Tatmadaw, the Socialists prevailed against the rather moderate representatives Aung Gyi and Maung Maung. However, Chit Hlaing played only a minor role in all of this. His big moment came only in March 1962 with the coup and the establishment of the Revolutionary Council (RC). The new rulers lacked a political ideology. Ne Win quickly roped in Chit Hlaing and two of his comrades to work out the new ideology. Chit Hlaing was one of the few in the ranks of the military who had the necessary knowledge and writing skills. The ideology should also give the RC legitimacy. Ne Win called for an ideological superstructure that emphasized the special status of Burma and held the country in equidistance to the political blocs of the Cold War. That’s how Chit Hlaing got the opportunity to write the policy declaration for the RC (The Burmese Way to Socialism) and later the official ideology of the BSPP (The System of Correlation between Man and His Environment). In formulating the two ideological key texts of the Ne Win era, Chit Hlaing essentially drew on his preparatory work of the 1950s. When reading the texts, the mixture of Marxist terminology and theory with Buddhist beliefs and Pali vocabulary is striking. The System follows a step-by-step approach: First, the construction of nature is determined, then the nature of man, and finally, society. Then man is identified as the crown of creation, the first mover and the measure of all things: „Man matters most.“ Man creates and transforms the social system, since he is an image of all three worlds. Man is finally defined as a social animal that knows both selfishness and altruism and shapes society. In the section on the formation and laws of society, Chit Hlaing increasingly uses Marxist terminology. Capitalism is criticized, it is about productive forces and the laws of dialectical materialism, but without the use of this term. Chit Hlaing speaks of the dialectical method or the dialectical law that he defines with the Pali term Paticccsamuppada (the conditionality of all beings). The revolution also occurs. At the end of this section, he defines the philosophical program of the BSPP and six economic laws for the Burmese way to socialism. It concludes with a reflection on the determining role of the workers in the new Burma and the role of the party or its behavior in its own ideology, which was expected to be neither complete nor conclusive with this program. The text outlines a kind of a Buddist-socialist utopia. Both texts were submitted to the RC. He let them pass without extensive changes. Former President Dr. Ba Maw published a commentary in the British newspaper The Guardian on January 23, 1963, in which he rubs his finger on the wound: „Basically, the [Revolutionary] Council has done the right thing. But what, as I see it, is wrong about this is that the common error has been repeated of confusing race with religion and religion with society, and so turning religio-metaphysical speculations into social truths and laws. In this way, a social philosophy based upon laws and conditions which are continually changing has been kept tied to religious dogmas which claim to be absolute and unchanging and go centuries back to an age immeasurably different from today.“ A problem which is virulent down to the present day. The fundamental texts of the socialist era are hardly comprehensible and often operate with contradictory concepts and ideas. One major issue is the fact that ideology and religion are different. Nevertheless, Chit Hlaing tried to reconcile incommensurate thoughts, religious beliefs and terms on the one hand, and ideology on the other, but Marxism and Buddhism have no common denominator. In the end, nothing remains but an accumulation of supposedly profound concepts that stand side by side without a mental connection. The conceptual blurring of the basic program does not provide a comprehensive explanation for the collapse of socialism in Myanmar; but it is at least an indication that there was a lack of clarity and consistency even at the beginning of the social experiment. The elaboration of the socialist principles was the culmination and at the same time the last highlight in Chit Hlaing’s career. He was no longer responsible for translating his theory into concrete politics. The next eight years Chit Hlaing spent as a lecturer for party cadres, before he left the BSPP in 1970 and retired in 1971. He became once again member of a political party after the NUP in 1988 was formed. But his role in post-88 Burma was that of a commentator and well respected intellectual and not that of an influential politician. 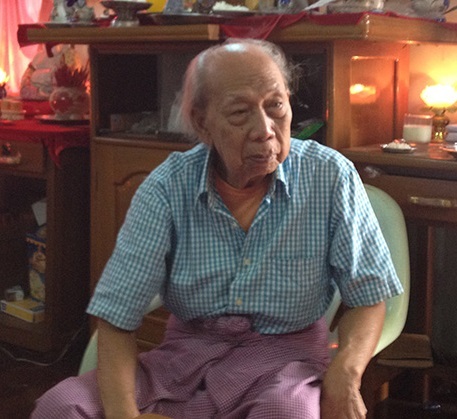 He died of natural causes on March 26, 2018 in Yangon General Hospital – aged 92. However, it should be remembered that Chit Hlaing educated and trained generations of officers, some of whom later went on to even become ministers or in the case of Than Shwe heads of state. Although socialism in Myanmar has been discredited as a political ideology and within the party landscape since 1988, Chit Hlaing’s philosophical ideas continue to thrive in the minds of Myanmar’s elites and military. Quoted from Nakanishi (2013), 64 f.
 In terms of content and form, The National Ideology remained very close to the constitution of 1947. Yoshihiro Nakanishi sees in the document, contrary to the prevailing interpretation, less the claim of the military to dominate the political agenda of the country (Nakanishis 2013, p. 76). It’s more of an attempt to create a loyal, united and centralized military. At that time, Chit Hlaing argued that officers of the army should engage in politics but stay as far removed from party politics as possible. The slogan of the military was understood to be something like: understand politics but don’t engage in politics. The Guardian, 23 January 1963; quoters after Nakanishi (2013), 62 f.
 See Obituary: „Obituary: Junta Insider Dies at 92“, The Irrawaddy, March 26, 2018, https://www.irrawaddy.com/news/burma/obituary-junta-insider-dies-92.html. Accessed October 23, 2018. Callahan, Mary P. 2003 Making enemies. War and state building in Burma. Ithaca [et.al. ]: Cornell University Press, 2003. Chit Hlaing 1963 The System of Correlation of Man and his Environment. The Philosophy of the Burma Socialist Programme Party. Nakanishi, Yoshihiro 2013 Strong Soldiers, Failed Revolution. The State and Military in Burma. Singapore: NUS Press. Taylor, Robert H. 2015 General Ne Win. A Political Biography. Singapore ISEAS. Walton, Matthew J. 2017 Buddhism, Politics and Political Thought in Myanmar. Cambridge: Cambridge University Press. Zöllner, Hans-Bernd (Hrsg.) 2008 Myanmar literature project. Working paper number 10:10. Soe, Socialism and Chit Hlaing, Memories. Introduction by Robert H. Taylor.